China has accused the former head of GlaxoSmithKline's operations in the country of ordering colleagues to commit bribery as part of a widespread scheme designed to raise drug prices. The charges against Mark Reilly, a British national, were revealed Wednesday by police in China's central Hunan Province and reported by state media. 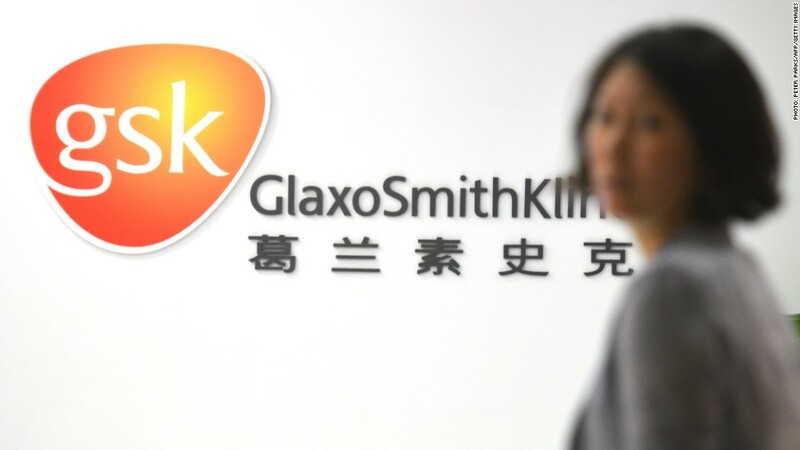 Two other GSK executives, Zhang Guowei and Zhao Hongyan, were accused of bribing government officials. The charges are the latest development in a year-long crackdown on pharmaceutical companies operating in China. GSK has previously been accused of channeling nearly $500 million through a network of 700 travel agencies to pay bribes to government officials, medical associations, hospitals and doctors. The British company's sales in China have suffered as a result of the crackdown. Investors have largely shrugged off the losses as the company's China business constitutes a small percentage of overall revenue. GSK shares were little changed in London trading. If found guilty of corruption, the company could face penalties in the U.K. and United States under laws covering bribery of foreign officials. GSK (GSK) admitted last year that the behavior of some executives appeared to breach Chinese law. In a statement Wednesday, it said it would cooperate fully with Chinese authorities. "We take the allegations that have been raised very seriously," a company spokesperson said. "They are deeply concerning to us and contrary to the values of GSK." Reilly's precise whereabouts were not immediately known. The executive had been allowed to leave China early in the investigation, but he is believed to have returned to the country. "We are in regular contact with Mark Reilly and providing consular assistance," John Gallagher, a spokesman for the British Embassy in China, said on Wednesday. Last year, four other senior GSK executives were detained by authorities. State television aired an apparent confession by one of the four, Liang Hong, explaining how the scheme worked, including the use of fake conferences and travel agencies to create receipts for services that were never performed. The surplus funds were allegedly then used to pay bribes. Medical workers are thought to be particularly susceptible to bribery in China because their salaries often lag behind other fields -- even though extensive education is required to enter the profession. -- CNN's David McKenzie contributed reporting from Beijing.